Where Are Those Running Shorts? Four years ago, I was able to buy two (2) sets of running attire (singlet & shorts) from the Nike Store, colored yellow and black. For some time, I haven’t used these attire but when I showed them to my son, I felt that he liked them, So, I gave them without any hesitation with the thought that I could buy another set of these running attires. But to my frustration, I haven’t been able to locate and buy those running attire from the Nike Store up to this time. During the ’80s, I’ve been using those Adidas running shorts and “copycats” from Botak Running attire. In the late ’90s, Speedo came up with running shorts with curved edges on its side which was made of water-proof clothing material. The Speedo shorts are light and comfortable. I got two of these and I am still using them in my practice runs. Later, Speedo came up with shorts which could be used for swimming and running and that’s the one I am using in my competetive runs. I also have those stretchable cycling shorts made for running (without pads) which are being used by elite runners but I guess, the Filipino runners are not yet adapted and used to this kind of running attire. During my races in the US in the mid-’80s, I’ve been using these cycling shorts and sometimes tight & stretchable jogging pants during cooler months. Also in the US, I was able to wear those “mid-rib” shirts during summer months. Today, wearing a tight & stretchable “mid-rib” shirt and a tight “cycling shorts” in competetive races in this country is a fashion statement! Two months ago, after going through all the Nike Stores in Manila, Cebu and Iloilo, I accidentally browsed around inside the SM City in Iloilo and found a nice running shorts from Accel and it was cheap. The length is too short which resembles to the “old running shorts” in the ’80s. Although I have used it once in my speed play workouts, I found the shorts very comfortable and found myself to be back in the ’80s again. When I joined the 1st City of Angels Half-Marathon Race in Los Angeles last December 4, 2006 with my daughter, I observed that she was “bouncing” during the run. “Bouncing” means that you are pushing much of your legs after your foot hits the ground. In effect, the whole body is bouncing as you run, creating extra effort to your legs, knees and body. Sometimes, bouncing creates a semblance of being suspended on the air for a half of a second before your leading foot strikes the ground. Well, I didn’t mind her style of running while we were on the race but I encouraged her to increase her speed and maintain her cadence and breathing rythym on the last 3-4 miles before the finish line. Immediately after the race, she was happy that she was able to improve her PR best time for the distance by 12 minutes. I congratulated her for the determination she had shown despite for the reason that she just had her “monthly visitor” (which she told me only after the race!). Anyway, while we were walking back to home (our house is 2-3 miles away from LA City Hall), I told her about her tendency to “bounce” during running. Of course, she told me that she is not “bouncing” when she runs. I described and demonstrated how she was “bouncing” while running. I also demonstrated to her how to “shuffle” while running. I suggested and recommended to her to adopt the “shuffle” style of running. Basically, I am a “shuffler”. Shuffling means that a runner does not need to raise his/her knees too much in the air and the foot should not be ahead of the knees while running. It is an exaggerated trotting of the feet with the ball of the feet or heel hitting much of the ground. This is the most relaxing way to run with the knees not being forced to exert extra effort. It takes time to practice and adopt this kind of running. But for me, this is the best running style I recommend for runners training for their first marathon. My running models in marathon in the ’80s; Bill Rodgers, Alberto Salazar, Robert de Castella, Toshihiko Seko, Steve Jones, and Waldemar Cierpinski; were all “shufflers”. My God, I am really that old and bald if you don’t know these famous marathoners in the past!!! I accidentally deleted my previous posting on this topic. I posted this topic while I was in Boracay Island for two days. Altitude Training or High Altitude Training dates back after the Mexico Olympic Games in 1968 where the city is located 2, 240 meters above sea level. It was at this time when world records on sprints and endurance sports were broken and some of the time records then were not yet surpassed up to this time. Most of the athletes from the high altitude places of Africa, Finland, and New Zealand had excelled in endurance sports events. Scientific studies showed that when the body is exposed to altitude training, there is less oxygen in the air and due to less oxygen intake, the body tends to develop new red blood cells. New red blood cells means more oxygen in the blood which is translated to more speed, power and endurance. This is the very reason why it was a part of my planning, practice and strategy to have my practice runs in Baguio City for a minimum of one month up to a maximum of two months. Although Baguio City (1, 530 meters above sea level) is not as high as Mexico City, it was the most accessible place where I can have my altitude training. I may not be as competetive as the national athletes at that time who were training in Baguio City, but I knew that altitude training gave me more endurance to finish the marathon race without any pains and had faster post recovery than the other runners. In all my marathon practices, I saw to it that Baguio practice runs were part of my training/s. Simulated altitude training gadgets are already available in the market by elite athletes in other more developed countries but they are expensive. However, I don’t recommend such gadgets/tents to average runners. Actual practice runs in higher elevated places is highly recommended as it is more affordable and economical. Baguio City is still my best bet to practice altitude running/training. The route from Silang, Cavite to Tagaytay and running within Tagaytay area is also an option. Another option which I tried before is the route from the UP Los Banos Grounds to Mt Makiling peak. 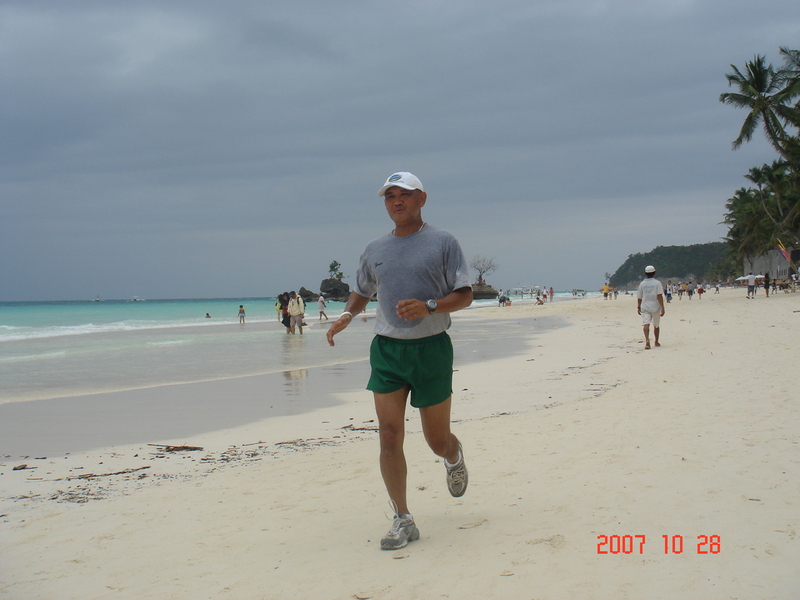 I had 40 minutes speed play along the beach of Boracay on 28 October 2007. It was a nice workout with winds coming from the North. If my recollection serves me right, I had my first marathon in 1981 after I successfully proven to myself that I could be a better competetive runner. The PMA Alumni Race where I won number 2 inspired me to plan and run for the Marathon Race. At that time, I was assigned in Region 1 (Northern Luzon) and my work included going to all the provinces of Ilocos Norte, Ilocos Sur, La Union, Pangasinan, Abra, Mt Province, and Benguet conducting seminars, lectures and meeting local government officials. However, most of the time, I stay in Laoag City because my office and staff were located thereat. I am a product of the “Old School of Running”—build-up enormous mileages for 3-4 months and slowly build-up and combine speed workouts for 2 months and “simulate” running the marathon distance for the last one month before the marathon race. In order to build mileage for the week, I have to run early in the morning for 10 kilometers and another 10 kilometers in the afternoon/early evening. And I did this from Monday to Friday. I usually run from our office in Laoag City to the Ft Ilocandia Golf Course and sometimes from Laoag City Poblacion to the Ft Ilocandia Hotel. The road/course is nice. And at that time, there were less traffic and vehicles plying those routes. On Saturdays, I do my long slow runs reaching up 20 to a maximum of 25 kilometers. Sunday was my rest day. Sometimes, I do my long runs on Sundays and make Monday as my rest day, and start my weekly runs on Tuesdays. Progressively, I increased my daily runs up to 15 kilometers per session and increase my weekend long runs up to 30 kilometers. My speed workouts were done in the athletic oval of Laoag and sometimes in the athletic oval of Teachers Camp in Baguio City (the one that was used by the Gintong Alay athletes of Michael Keon). My speed plays vary when I am in the oval but most of the time they consisted of 400-meter fast and 400-meter recovery runs by jogging slowly. I usually do 10 to 15 repeats of the speed runs. However, I became creative with my speed plays. I did my speed runs on my road runs by using the kilometer markers as my reference points (alternately, running faster in-between two kilometer markers and then doing my recovery/slow jog up to the next kilometer post). Sometimes, I use the electric posts along the road/streets as my reference points for shorter speed plays. But what made me more creative was when I discovered the “color-coded” foot trails around the perimeter-slopes of Camp John Hay Base in Baguio City (when the Americans were still running/managing that camp). In every sector of the perimeter of the camp, the trunks of the pine trees along the trails were painted with spots of dark red, green, blue, orange, and white paints. So, I alternately did my speed plays every other colored trail while running. I really don’t know if these “color-coded” trails are still there. To “simulate” or practice the marathon one month before the race, I should be able to run at least 35 kilometers during my weekend long slow distance workout with minimum effort. I have one of my men “leapfrog” every 3-4 kilometers for my regular water intake/supply. I start my run at the same time with that of the race starting time. I did my practice runs alone on the road, ovals, and trails. I finished my first Marathon race, the Manila International Marathon, in 3 hours; 24 minutes; 46 seconds. Finishing my first marathon race entails planning, hardwork, persistence, patience, discipline and commitment to finish the race. Such values and attitude I need to pursue my life and carreer in this ever challenging and unpredictable world. Marathon race is life in itself. When I was a cadet at the Academy, there was only one type of athletic/sports shoes issued to everybody, that was the Converse Rubber Shoes (Hi-cut), colored white, which was basically for Basketball. Yes, that was the running shoes we used in that long distance race where I had my first taste of competetive running. During my first and second Alumni Homecoming Running Competitions in 1980 & 1981, I was using the cheapest Adidas Running Shoes which was made of soft leather and thin soles. Although it was heavy as compared in today’s running shoes’ technology, this particular shoes endured my long distance runs which made me one of the top runners among my peers. My wife left for the USA on the later part of 1981 and since then I was getting a regular supply of “state-of-the-art” running shoes. She sent me the latest model of the New Balance Series 300. I guess, she had chosen New Balance because the symbol “N” on the sides of the shoes corresponds to the first letter of our last name. At that time, it was only the New Balance shoes that were exclusively “Made in USA” while Adidas Shoes were made in Germany then. Since 1981, I used at least two models of New Balance Running Shoes in my running practices and was able to finish three (3) Marathon Races up to 1983. I really liked New Balance shoes because it was the lightest running shoe at that time that provides comfort on the heel portion because of its thick soles and it has an integrated anti-pronation system. Up to this time, I am still using a New Balance Shoes for my practice runs. Although my shoes (NB 716) which was bought three years ago is already old, I still feel comfortable with it. This is the shoes I am using here in the mountains of Jamindan. During the summer of 1983, I ordered from my wife the lightest running shoes in the market and specifically asked her an ASICS Tiger Running Shoes. Since then, I’ve been using ASICS Tiger Shoes for my racing days. Presently, I am using a “Cumulus” Model of ASICS Tiger which my wife bought last December 2006 at the Phidippides Sports Center, along Ventura Blvd, Encino, CA. I really like and appreciate the staff of this sports store as they made me run for about 50 meters to observe my footwork. This is my fourth ASICS Tiger running shoes since 1983. If my recollection is right, I have been using ASICS Tiger shoes to finish another five (5) Marathon races since then. So, as an old runner, my running shoes preference is limited to my New Balance shoes which I use for my running practices and my ASICS Tiger shoes which I use only for my competetive races. 1) Keep a record of your morning pulse. Lie in bed for a few minutes after you awaken and then take your pulse. As your training progresses, it will gradually become slower and after three months or so plateau out. From then on, if you awaken and find a rate of 10 or more beats higher, you have not recovered from your previous day’s runs, races or stresses. Take the day or more off until the pulse returns to normal. 2) Weigh yourself regularly. Initially you will not lose much weight. What you lose in fat you will put on in muscle. Running consumes 100 calories a mile and there are 3,500 calories to a pound so you can see weight loss will be slow unless you do heavy mileage. 3) Do your exercises daily. The more you run, the more muscle imbalance occurs. The calf, hamstrings (back thigh) and low back muscles become short, tight and inflexible. They have to be stretched. On the other hand the shins, the quads (front thigh) and the belly muscles become relatively weak. They must be strengthened. Learn the Magic Six: Three strengthening exercises, three stretching exercises. 4) Eat to run. Eat a good high-protein breakfast, then have a light lunch. Run on an empty stomach at least two, preferably three hours after your last meal. Save the carbohydrates for the meal after the run to replenish the muscle sugar. 5) Drink plenty of fluids. Take sugar-free drinks up to 15 minutes before running. Then take 12 to 16 ounces of easily tolerated juices, tea with honey or sugar, defizzed Coke, etc. before setting out. In winter that should be all you need. 6) Run on an empty colon. Running causes increased peristalsis, cramps and even diarrhea. Having a bowel movement before running and particularly before racing prevents these abdominal symptoms. 7) Wear the right clothes. In winter this means a base of thermal underwear followed by several layers of cotton or wool shirts with at least one being a turtleneck. Wear a ski mask and mittens. Use nylon if necessary to protect against wind and wet. In summer the main enemy is radiant heat. Remember to wear white clothes and use some kind of head covering. 8) Find your shoes and stick to them. High-arch feet do better with narrow heels. Morton’s Foot (short big toe, long second toe) may need an arch support in the shoe. If a shoe works, train in it, and wear it to work. 9) The fitness equation is 30 minutes at a comfortable pace four times a week. Your body should be able to tell you that “comfortable” pace. If in doubt use the “talk test”. Run at a speed at which you can carry on a conversation with a companion. 10) Run economically. Do not bounce or overstride. You should lengthen your stride by pushing off, not by reaching out. Do not let your foot get ahead of your knee. This means your knee will be slightly bent at footstrike. Run from the hips down with the upper body straight up and used only for balance. Relax. 12) Wait for your second wind. It takes six to 10 minutes and one degree in body temperature to shunt the blood to the working muscles. When that happens you will experience a light warm sweat and know what the “second wind” means. You must run quite slowly until this occurs. Then you can dial yourself to “comfortable,” put yourself on automatic pilot, and enjoy. 13) Run against traffic. Two heads are better than one in preventing an accident. Turn your back on a driver and you are giving up control of your life. At night wear some reflective material or carry a small flashlight. 14) Give dogs their territory. Cross to the other side of the road and pick up some object you can brandish at them. Never try to outrun a dog. Face the dog and keep talking until it appears to be safe to go on. 15) Learn to read your body. Be aware of signs of overtraining. If the second wind brings a cold clammy sweat, head for home. Establish a DEW line that alerts you to impending trouble. Loss of zest, high morning pulse, lightheadedness on standing, scratchy throat, swollen glands, insomnia, palpitation, are some of the frequent harbingers of trouble. 16) Do not run with a cold. A cold means you are overtrained. You have already run too much. Wait at least three days, preferably longer. Take a nap the hour you would usually spend running. 17) Do not cheat on your sleep. Add an extra hour when in heavy training. Also arrange for at least one or two naps a week and take a long one after your weekend run. 18) When injured find a substitute activity to maintain fitness. Swim, cycle or walk for the same time you would normally jog. 19) Most injuries result from a change in your training. A change in shoes, an increase in mileage (25 miles per week is the dividing line; at 50 miles per week the injury rate is doubled), hill or speed work, or a change in surface. Almost always there is some associated weakness of the foot, muscle strength/flexibility imbalance, or one leg shorter than the other. Use of heel lifts, arch supports, modification of shoes and corrective exercises may be necessary before you are able to return to pain-free running. 20) Training is a practical application of Hans Selye’s General Adaptation Syndrome. Stress is applied, the organism reacts, a suitable time is given to reestablish equilibrium. Then stress is applied again. Each of us can stand different loads and need different amounts of time to adapt. You are an experiment of one. Establish your own schedule, do not follow anyone else’s.